One of the main reasons computer security experts say that you should always keep your files backed up on a cloud drive (or another storage system) is the likes of RaaS Ransomware. Lately, we have been experiencing an onslaught of the so-called crypto ransomware infections. These programs encrypt user’s files and ask for a ransom fee to be transferred as soon as possible. Unfortunately, the chances are that the encrypted files cannot be restored because money is the only thing on the criminals’ minds. However, you can still protect your computer from the likes of RaaS Ransomware by acquiring a reliable antimalware application. Not to mention that there might be some leftover files on your PC you have to delete. ATTENTION! The files on your computer have been securely encrypted by Encryptor RaaS. If you were to click the link indicated in the program’s notification, you will be requested to send Bitcoins to the criminals’ Bitcoin-wallet. The message also says that once you transfer the payment you should receive the decryptor within 12 hours. If you pay, your files should be decrypted automatically, but there is no guarantee this is what is really going to happen. The people behind this infection are far more interested in getting rich that unlocking your files. On top of that, almost anyone can buy RaaS Ransomware on the Tor network, and then distribute it whichever way they prefer. As a result, this ransomware program becomes a formidable tool of easy money making. As far as the distribution is concerned, RaaS Ransomware may employ various methods to arrive at target computers. You should be careful when you open email messages from unfamiliar senders. Ransomware programs often travel in spam email attachments, and by opening an attachment you launch the installer file. What’s more, RaaS Ransomware might also be spread around by a Trojan infection, and Trojans usually get around in software packages. This means that there is a good chance that there are several unwanted and dangerous programs on your computer ASIDE from RaaS Ransomware. While you cannot do much about this ransomware infection, you can still protect your system against other intruders. Get yourself a legitimate antispyware tool that would help you scan your PC and detect all the potential infections. Remove them automatically with a computer security application of your choice. As for your encrypted files, you may try using a professional decryption tool. There are quite a few available online. However, if you are not sure of your technology skills, you can always leave us a comment below, and we will try our best to provide you with the best piece of advice there is. Type http://www.pcthreat.com/download-sph into the address bar. Hit Enter and click Run on the pop-up box. 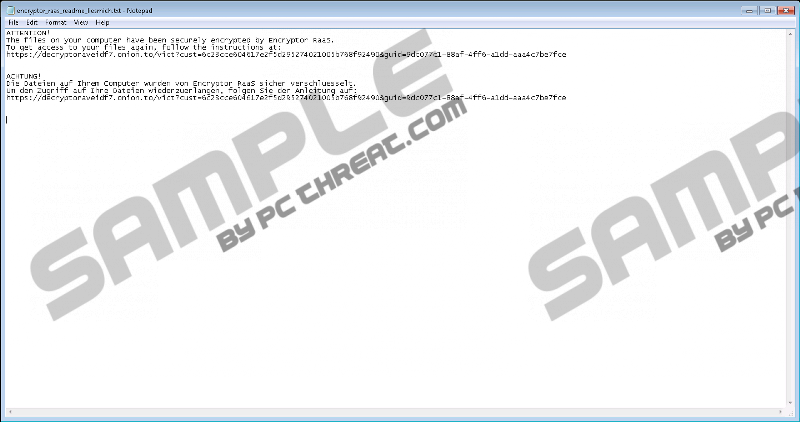 Download SpyHunter and run a full system scan with it. Quick & tested solution for RaaS Ransomware removal.